Among the questions we're asked most often is how much one can expect to pay for a C-arm. 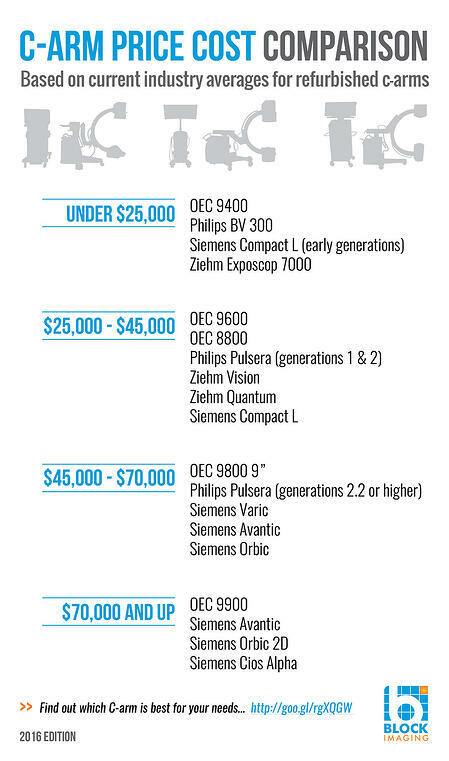 Check out this awesome infographic comparing C-Arm prices between OEC, Siemens, Ziehm, and Philips C-Arm machines to get the answer. Why the Large Price Variation? The key factors in determining price are the age, capabilities, and warranty of each system. With the wide variety of model years, configurations, and provider coverage available, there's a corresponding price point for each combination of the three. If you have more questions about which C-Arm to purchase, let us help you find the best C-Arm for your patient service needs as well as your budgetary needs. If you prefer to learn more on your own, you can check out our free C-Arm resource page.